Wanting to create a favorable impression with others is a basic part of human nature in both work and personal life. 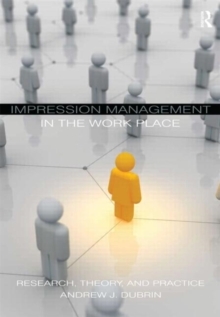 In this book, Andrew J. DuBrin skillfully provides a guide to the effective use of impression management based on scholarly research and theory, with particular attention to practical application. He highlights not only impressions that individuals make, but those made by entire organizations. Self-tests and questionnaires allow readers to pinpoint how they currently employ impression management techniques in their work lives. Each chapter includes a section on "Guidelines for Application and Skill Development" that provides real-world advice based on the theories and research outlined in the chapter. With this book, students will glean the best methods for creating positive, career-building impressions in current and future positions.